SPL Meter is a professional-grade sound level meter, also known as a decibel or dB meter, for your iPhone or iPod touch. Modeled after a traditional analog SPL meter, we have faithfully reproduced all the characteristics and qualities found in those meters, including the ballistics, ranges, filters, and decay rates. But don't compare us to a Radio Shack meter, ours is much more accurate! 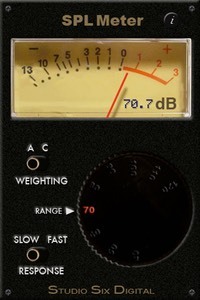 SPL Meter is included in our premier audio analysis App, AudioTools. Consider buying AudioTools rather than the standalone meter, if you may want more than just an SPL Meter. We have also included a small digital LCD display, as shown in the picture, to make this the best SPL meter on the store. And this is something that the old analog meters never had! SPL Meter is built by the same team that created the other great professional audio and acoustics apps on the store, Studio Six Digital. Built on the engine of our more expensive "SPL" app, SPL Meter's filters and decay rates meet or exceed ANSI type 1. See our "dB vs. dB" page to understand what the SPL numbers mean, and why they might be different on different modules. SPL Meter is the one audio app that everyone who works in audio must have on their phone! Not only have we made the best one, but we've priced it so anyone can afford to have it. ANSI A and C weighting filters are provided. Just flip the switch to select the filter. A weighting rolls off low frequencies fairly steeply, and also rolls off high frequencies. Think of this as a "speech" filter. C weighting rolls off low and high frequencies slightly, think of this a a "music" filter. Flip the switch to choose ANSI Fast or Slow. Slow will give you a better average reading, while Fast will follow peaks better. Select 40dB to 120dB in 9 ranges. Whatever range is selected, this is the value at the 0dB mark on the meter. Don't worry if you peg the meter, you won't bend the needle. Low Range — With the internal iOS microphones, this will cover a range of approximately 30 - 100 dBA SPL. High Range — This will extend the range to 50 - 120 dBA SPL.